Advisers usually make all sorts of nice promises about their longevity and commitment to clients, yet virtually no firms are actively building a team of younger advisers to come through, nor do they have a viable succession plan emerging (let alone in place). The most common approach is that come exit time, the business will be sold, allowing the adviser owner to retire (hopefully in style). But this creates a dilemma for the adviser owner come exit time. No one I know sets out to sell their clients down the river to some large corporation that doesn’t hold the same values and standards of client care as you do. But if, come sale time, the only place that can write you a big enough cheque is some large corporation (or venture capital backed consolidator), what would you do? We’re all going to get to the point of selling the business one day, so how do you avoid leaving yourself no choice at exit time? Most firms (I reckon more than 98%) are not taking any proactive action to avoid this situation and will find themselves in a similar position. All they are focused on is building more and more assets under management and recurring income. Now let me be absolutely clear; I’m not judging anyone for this choice. Faced with the same choice, I know I would take the money. However, now that we’ve identified the elephant in the room, is it still acceptable to go down this path and take the money from the highest bidder? That’s a pretty personal decision and I respect whatever choice people make, but let’s investigate the elephant a little further. What would you have to do to avoid putting yourself in this position? Are there any existing team members who might be up for this? Could you make it easier for them by funding some of the buy-out, or accepting a lower price or deferred payment terms? What would need to happen with your own personal financial plan to make you feel secure enough to even consider the point above? What training, mentoring and development would other team members need to give them the skills necessary to succeed after you are gone? How long will those skills take to acquire? What time and money would be involved to develop them? How do you ensure the person you’ve selected is the ‘right’ one? Is it wiser to have more than one potential successor coming through? What firms can you identify that might be interested in purchasing your business with the bulk of your existing team? What would need to happen and over what time frame, to allow closer links to be forged pre-sale (giving the best chance of post-sale success)? This is an issue I know lots of advisers take very seriously, and so it requires careful consideration in your future business planning. Failure to address things early enough will simply leave you boxed in, as many others have been before you. However, by exploring some of these questions now, you can start to take a more strategic approach to your final exit, ensuring that the promises you’ve made to your clients have a better chance of being kept. We were absolutely delighted by the news that Juno Wealth Management, one of our participants in the first Uncover Your Business Potential course had won Small Business of the Year in the recent Business Matters Annual Awards 2015. Congratulations to Tracey, Derek and the rest of the team for a fantastic achievement – we’re so thrilled for you! 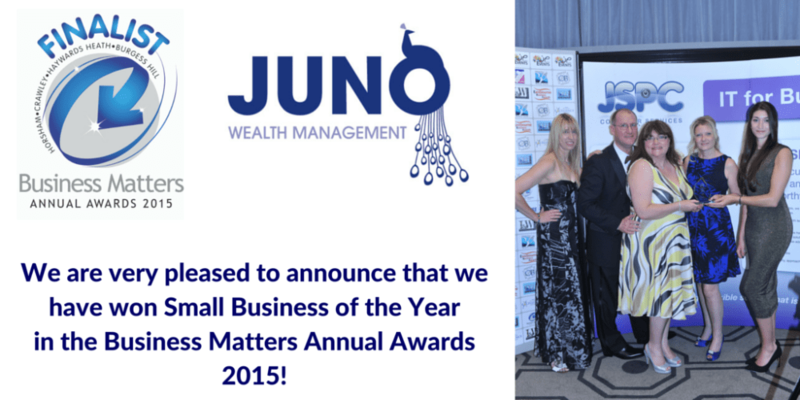 Make sure to follow Juno Wealth on Twitter, Facebook or LinkedIn. Here’s how they announced their win on Twitter – looking great, Team Juno!